Frankie Banister and his parents run a hotel but it’s not a hotel that you would have heard of or seen for that matter. The Nothing to See Here Hotelis mostly invisible to the human eye and if you do manage to make it to the entrance, then the waft of foul air will certainly send you in the other direction, quick smart. That is of course if you are a human. If, on the other hand, you happen to be a magical creature then this is the place for you when looking for a wonderful seaside holiday. 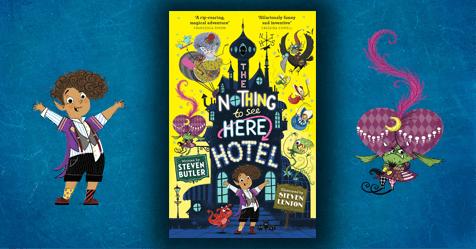 The Nothing to See Here Hotel welcomes goblins, tooth fairies, oafs, trolls and ghosts – you get the idea. When a goblin messenger arrives announcing that the goblin prince Grogbah will be spending his holidays at The Nothing to See Here Hotel, the Banister family go into over drive. They are determined that the prince will be impressed by their beloved hotel and that everything will be perfect for his stay. From the minute that he arrives however, things start to go wrong. The prince brings with him an entourage of hundreds and is a demanding tyrant used to getting his own way all the time. The only problem is that if the hotel doesn’t live up to expectations the prince may just get his guards to put a rapid end to the hotel and to all the occupants’ lives! Steven Butler grew up in Kent, but now lives in London. He is the author of the bestselling The Diary Of Dennis The Menace and The Wrong Pong fiction series. As well as writing the hit 2015 World Book Day title, World Menace Day, Steven also is the regular host of World Book Day’s The Biggest Book Show on Earth which takes place every year to celebrate the event. Steven is also a successful performer and voice artist. Steven’s first novel, The Wrong Pong, was shortlisted for the prestigious Roald Dahl Funny Prize in 2009. Steven Lenton hails from Cheshire and now works from his studio in Soho, London creating an array of charming characters for his picture books. Best known for illustrating the bestselling Shifty McGifty series written by Tracey Corderoy, Steven has illustrated many lovely books as well as writing and illustrating his own stories.